Why? Because you can’t traverse any further up the filesystem than the root, /. Also worth mentioning, macOS is UNIX despite its kernel name, XNU. IIRC, the reason DOS and then Windows got stuck with “\” is that Microsoft chose the “/“ character as the prefix for command line qualifiers back before DOS even supported directories. Unices, of course, use “-“ for options and “/“ for directories. Given that DOS was entirely command-line driven, the need for the command parser to split out options easily from filenames meant that a character other than “/“ was needed for the latter. I guess “\” was the closest choice. Microsoft didn’t choose it, and it pre-dates DOS, going back to an earlier operating system called CP/M. DOS inherited most of CP/M’s (mis)features for backwards compatibility, and wasn’t created by Microsoft in any case; DOS was originally developed by Seattle Computer Products before Microsoft bought it and immediately licensed it to IBM, thus screwing Seattle Computer Products out of a lucrative licensing deal. But that’s another story. DOS’s backwards compatibility with CP/M was its main selling point, as Microsoft also sold their version of Unix, called Xenix, for the IBM PC, but it proved unpopular because it couldn’t run WordStar. Many Windows misfeatures (such as drive letters starting from C:) are actually ancient fossils of CP/M which Microsoft had nothing to do with, except for painstakingly preserving them. Microsoft did choose, in any reasonable sense of the word, to use “/“ as the command option marker, just as it chose “..” for go up a directory in Xenix. When you adopt an artefact for your product in order to maintain some sort of compatibility, or because you like it, or because you don’t want to hassle of changing it, that is a “choice”. There are lots of intriguing CP/Misms in DOS that I would consider a “Microsoft choice” to maintain. For example, the fact that zero is pushed on the stack when loading programs so you can exit with a RET, and the INT 20h that was placed at offset zero to make the RET work. But I don’t think your suggestion that buying QDOS off SCP did *SCP* out of a massive licensing deal is quite right. Intergalactic Digital Research, makers of CP/M, not of QDOS, were as far as I know the only serious challengers for the IBM PC operating system deal that set Microsoft on the trajectory that made it a huge company. IIRC, the SCP company wasn’t trying to license software to IBM, it intendee to sell its own hardware in competition to the forthcoming IBM PC. The most credible story I have heard of why Microsoft won the deal with IBM is that Gates and Allen immediately signed IBM’s non-disclosure agreement and thus jumped straight into negotiations. But Gary Kildall of Digital Research understandably wanted time to make sure the NDA wouldn’t do him out of business, and that delay left him too far behind in the race to close the deal to catch up. Windows uses ‘/’ too, all the OS calls accept ‘/’ as a path separator. Never gonna give up the book tours! 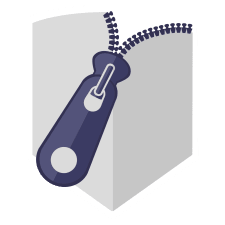 On macOS, OS files are protected by Apple’s System Integrity Protection. They can’t be overwritten or modified by users. Not even with Sudo. Even if you login as root. Trying to modify anything in /Applications requires authentication by a user with admin rights. There does not appear to be any good reason to allow ../ at the beginning of a file name in a Zip file. +1 to both your points. OTOH, “-o” was the Unix way (now augmented by GNU’s “–option” option), and has ultimately flowed back into the Windows world.